Learning math can be hard. Brick Math makes it easier! 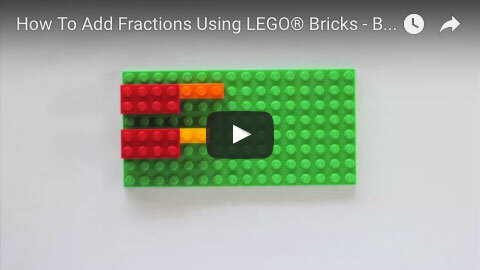 Brick Math helps students learn the basics of the K-6 math curriculum by modeling with LEGO® bricks. Specific math subjects include: Counting, Addition, Subtraction, Multiplication, Division, Basic Fractions, Basic Measurement, Fraction Multiplication, Fraction Division, Decimals, and Advanced Measurement and Geometry. When students are taught with Brick Math, they develop a deeper understanding of the concepts that are the foundation of true mathematical knowledge. 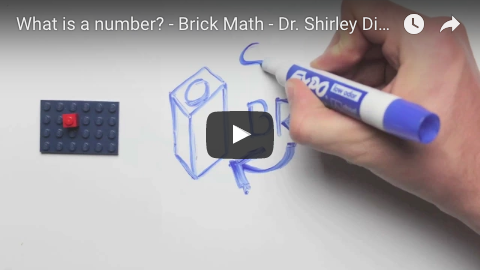 Author of Brick Math, Dr. Shirley Disseler, thinks there’s no such thing as a student who is “bad at math." She says they just need to be taught using techniques that are “good for teaching.” The Brick Math activities work for teachers in the classroom, as well as for parents who need a way to help their kids with homework. They are perfect for a homeschool curriculum, and for remediation, intervention, and gifted learners. Read FAQs to learn more about Brick Math. 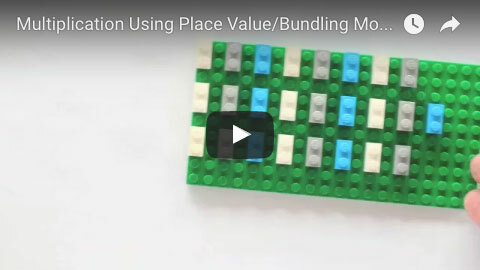 LEGO® bricks make learning math fun! EASY TO LEARN. EASY TO TEACH. ​Use the lessons in the Teacher Edition for any math subject. Start by taking students through the Part 1: Show Them How section of each chapter. Build the brick models, show them to the students, and ask students questions as directed. Be sure to use the math vocabulary for each lesson. Have students build the same models themselves so they are manipulating the bricks as you are guiding them. If possible, use a document camera to display your models as you build them. Then have students draw their models and answer the questions in their companion Student Editions. ​Once students have mastered the modeling processes from Part 1, move to the Part 2: Show What You Know section of the chapter. Ask students to complete each of the problems, first by modeling with bricks and then drawing their models in the companion Student Edition. ​Move through the room, checking that students are building their models correctly and that they understand the concepts behind the models. The Student Editions include an assessment for each chapter, as well as additional problems for practice and challenge. Active learning breeds active learners! Students will be motivated and engaged in math when they are using bricks. It will not be quieter in your classroom, but it will be full of chatter about math! 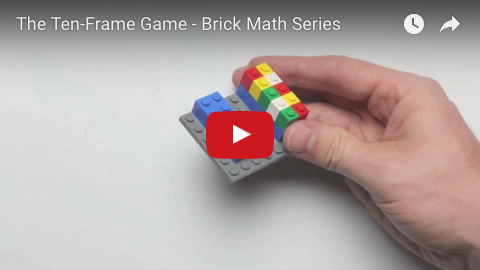 Brick Math is designed to be used with basic LEGO® bricks or compatible bricks. 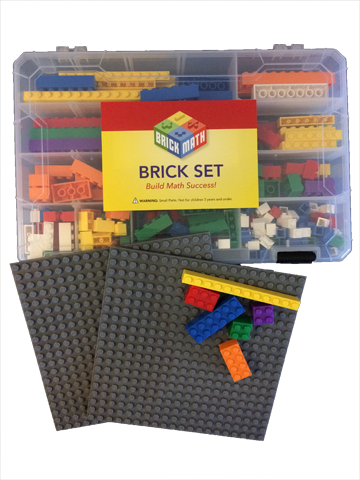 Brick Math brick sets, specially designed for the program, are available. The sets are packaged in sturdy divided storage boxes and are intended for use by two students. Two baseplates are included with each Brick Math brick set. ​If you already have bricks in your classroom, your students could to use them to build the models. They may have to combine smaller bricks together when the directions call for longer bricks such as 1x10s or 2x12s. Each student also needs a baseplate on which to build brick models, so the bricks don't move around. Each chapter lists the bricks suggested for the lessons in that chapter for every two students. Each book includes a total brick inventory that lists all the bricks suggested for the program for every two students. Before starting, have a conversation with the students about using bricks as a learning tool rather than a toy. 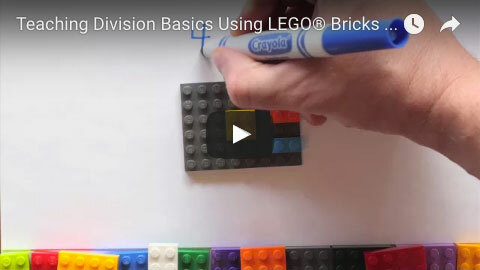 Teach students the language of the bricks (baseplate, stud, 1x1, 1x2, etc.). Assign brick sets to specific students by number and always give the same students the same sets. This helps keep students from taking home or misplacing bricks. If they know they will always have to work with the same brick set, they are more likely to be careful with their set. Do not teach with bricks—or any manipulative—every day. Students also need to think through the math processes without a physical model. To keep bricks clean, put them in a hosiery bag and wash on the top rack of the dishwasher. Let them air dry. To keep bricks from sliding off desks, use foam shelf liner cut into rectangular sections or large meat trays (you can often get these free from a local supermarket). Brick Math is based on theories of Constructionism and brain research. Numerous studies have shown the effectiveness of teaching math using manipulatives to incorporate a hands-on style. 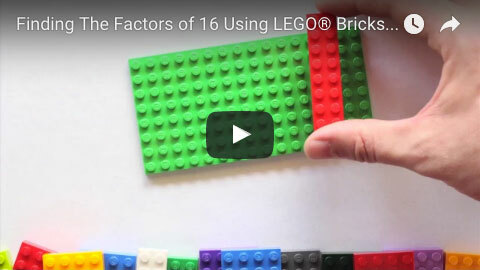 Brick Math builds on this body of research by utilizing LEGO® bricks as the manipulative, adding elements of creativity and enjoyment to learning foundational mathematics.